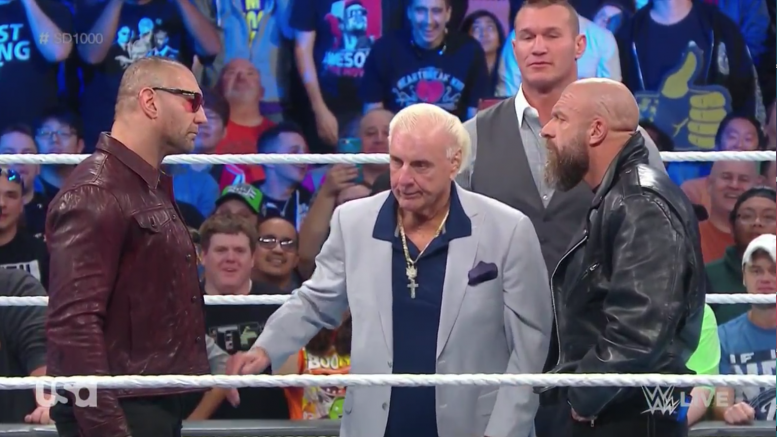 Dave Bautista returned to WWE during SmackDown‘s 1000th episode for an Evolution reunion … but it ended with a tease for the match against Triple H that he’s been wanting. Evolution’s segment on SD 1000 featured every member addressing the crowd and talking about how special their time in the group was. Bautista was last to speak and got a big ovation from the crowd. Following a passionate promo, he ended mentioning that Triple H has never actually beat him one-on-one. This comment prompted a stare down between the two legends, before a slightly awkward hug. It was apparent, however, that the seeds had been planted for a future match. On a May 2017 episode of Chris Jericho‘s “Talk Is Jericho” podcast, Bautista talked specifically about wanting to come back for a program with Triple H before his retirement. Is WWE finally interested? Guess we’ll have to wait and see.